Os principados da Valáquia e da Moldávia, durante séculos sob a suserania do Império Turco Otomano, garantiram a autonomia em 1856. Eles se uniram em 1859 sob o novo nome da Romênia. O país ganhou a independência total em 1878 e adquiriu novos territórios, após a Primeira Guerra Mundial. A ocupação soviética do após a Segunda Guerra Mundial levou à formação de um país comunista em 1947. A Romênia passou por grandes transformações políticas na década de 1990 e juntou-se a União Europeia em 2007. Religions: Eastern Orthodox (including all sub-denominations) 81.9%, Protestant (various denominations including Reformed and Pentecostal) 6.4%, Roman Catholic 4.3%, other (includes Muslim) 0.9%, none or atheist 0.2%, unspecified 6.3% (2011 est.). Ethnic groups: Romanian 83.4%, Hungarian 6.1%, Roma 3.1%, Ukrainian 0.3%, German 0.2%, other 0.7%, unspecified 6.1% (2011 est.). 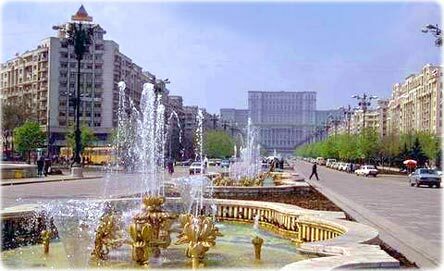 Languages: Romanian (official) 85.4%, Hungarian 6.3%, Romany (Gypsy) 1.2%, other 1%, unspecified 6.1% (2011 est.). 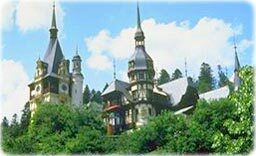 Peles Palace, located in Sinaia, Transylvania. Built between 1873 - 1883. 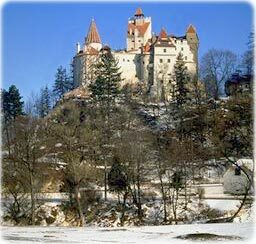 Bran Castle (Dracula's castle), in the Carpathian mountains, Transylvania. Independence: 9 May 1877 (independence proclaimed from Turkey; independence recognized 13 July 1878 by the Treaty of Berlin; kingdom proclaimed 26 March 1881; republic proclaimed 30 December 1947). Administrative divisions: 41 counties (judete, singular - judet) and 1 municipality (municipiu); Alba, Arad, Arges, Bacau, Bihor, Bistrita-Nasaud, Botosani, Braila, Brasov, Bucuresti, Buzau, Calarasi, Caras-Severin, Cluj, Constanta, Covasna, Dimbovita, Dolj, Galati, Gorj, Giurgiu, Harghita, Hunedoara, Ialomita, Iasi, Ilfov, Maramures, Mehedinti, Mures, Neamt, Olt, Prahova, Salaj, Satu Mare, Sibiu, Suceava, Teleorman, Timis, Tulcea, Vaslui, Vilcea, Vrancea. Terrain: central Transylvanian Basin is separated from the Plain of Moldavia on the east by the Carpathian Mountains and separated from the Walachian Plain on the south by the Transylvanian Alps. Highest point: Moldoveanu 2,544 m.
Climate: temperate; cold, cloudy winters with frequent snow and fog; sunny summers with frequent showers and thunderstorms. Ports and harbors: Braila, Constanta, Galati, Mangalia, Sulina, Tulcea.